My love of kimono has led me to wonderful adventures that I would have never anticipated. I spend four years in Okinawa. We had a Japanese culture class once a week for an hour, teaching us Japanese etiquette, simple phrases in Japanese and how to sing folk songs. I first wore a kimono when I was 8. I dressed in a little girl’s furisode for Girl’s Day. Everyone came to school in a kimono, even the boys did, on Girl’s Day. Years later, my husband and I attended a convention in Atlanta, where people would wear costumes. I thought: why not wear real clothing, like a kimono? 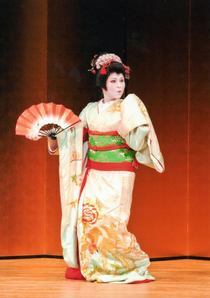 So I began to research kitsuke and everything needed to wear a kimono. It took me one year to purchase my first complete kimono. Then, I had to practice kitsuke! At last, I was ready, so I wore a light yellow komon, with a purple and gold nagoya obi to the convention. While there, I went to the vendor’s room and met someone selling vintage kimono. I was asked if I would be interested in helping sell kimono by dressing potential customers. I would be paid in kimono. I was in heaven! Several months later, I was asked if I would be interested in selling kimono. I started Kimono USA, to spread the love and joy of wearing kimono and all the related artistic skill of dying and weaving of kimono and obi. At Japan Fest, I met a teacher with Mai no Kai and started to learn Nihon Buyo. Four years later, I danced in Tokyo with Kozakura Kai. Kimono instantly makes you feel elegant and encourages you to move gracefully. It is wearable art. Everything about kimono is imbued with meaning and history. I think it is important to share this unique and beautiful tradition.